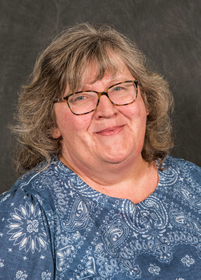 Jane Miller works in the Technical Services area of the Lesar Law Library as a library specialist. She is responsible for the check-in operation of all serials and the maintenance of the loose-leaf services in the library. She had previously worked in the Microforms area of the Lesar Law Library. She has been at the Lesar Law Library since 1996. She graduated from SIU Carbondale with a B.S. in Radio and Television in 1983.